What do you want to see on an album cover? An aesthetically pleasing piece of artwork, a photo of the musicians or an image that grabs your attention? One of the records from which a tune of over sixteen minutes is included in this week’s Cosmic Jazz probably comes into the latter category. It is almost scary in appearance – see for yourself. The cover, along with playing the music, was brought to my attention by staff at Soundclash Records in Norwich. The record is Work, Money, Death by Leeds-based tenor saxophonist Tony Burkill. The show this week includes the outstanding tune from Tony’s album, Beginning and End: an intense tune that builds and builds, with Tony’s sustained sax playing, the insistent rhythms of the Headingley Hand Choir and guest piano from Matthew Bourne (the jazz musician, not the dancer). It is good to see records emerging from across the UK and not just London. Manchester is well established through Gondwana records and Tony is not the only jazz musician to emerge from Leeds – the Roller Trio came out of the music college in the city. The show opened with two of the artists that over the years rank among the most-played on Cosmic Jazz. The first came from Carmen Lundy, who over a number of years has been right up there among our favourites. She is widely respected but does she get the veneration she deserves, does she perform in the UK as often as we could expect? Probably not. You’re Not In Love is one of those tunes which illustrate her strength of purpose not only through the lyrics but also her voice which at the same time has a sultry, sensuous quality. It is a live version from a concert recorded at the Madrid Theatre, Los Angeles in February 2005. The second artist in this category is pianist Keith Jarrett from another live album After the Fall recorded in Newark, New Jersey in late 1998 but released in 2018. The selection this week is a classic tune When I Fall In Love, the first version of which was recorded in 1952. Here Jarrett is accompanied by classic jazz musicians – Gary Peacock on bass and Jack de Johnette on drums. Recommended. The cover of the Jamie Saft Quartet was mentioned last week. Perhaps best ignored for the oblique, idiosyncratic words but the visuals are interesting. The most important thing, though, is the music. It is really good and, at times, outstanding. One of the very best tunes on the album Blue Dream (available on CD or double vinyl) on the excellent Rare Noise label is Words and Deeds. Listen out as the tenor sax of Bill McHenry comes blasting in – a powerful moment. There a further reggae connectionon the show this week – this time from Nat Birchall, another sax player from the North of England. He has always cited dub reggae as one of his true inspirations and for his album Sounds Almighty has enlisted the support of veteran Jamaican trombonist Vin Gordon, whose contributions to vintage ska back in the day are legendary. Also linked to the Caribbean, although more in name and political intent than through the music, is the highly recommended album from Nicholas Payton – Afro-Caribbean Mixtape. Nicholas Payton is one of an increasing number of black jazz musicians who are using their music as a vehicle to express political viewpoints. The classical connection comes from John Coltrane from the newly-released lost album Both Directions At Once. The tune Vilia Take 3 is Coltrane’s improvisation of a piece from the operetta The Merry Widow by Austro-Hungarian composer Franz Christian Lehar. The show ends with another contribution from the British New Wave. The excellent Maisha from Gilles Peterson’s Brownswood compilation We Out Here exemplifies the approach of these new groups. There was a reference to Brazil in the title of the next tune, Recado Bossa Nova from Bulgarian pianist Kostov Panta Konrad and his trio comprising a Polish drummer and bass player. Their album manages to combine original compositions with interpretations – and good ones too – of classical composers Albinoni, Chopin and Gershwin. Japan is never far away from the programme and this week’s contribution came from DJ/musical director/former member of United Future Organisation Toshio Matsuura. It was from an album released by the Gilles Peterson’s label Brownswood under the direction of UK drummer Tom Skinner. Change a really interesting take on Bugge Wesseltoft’s tune from his superb album of the same name. Compare with the original here. In fact, Tom Skinner was to appear later in the programme as a member of Sons of Kemet, the band led by sax player Shabaka Hutchings. This is such an original and politically significant album. The tuba of Theon Cross is prominent and provides almost a New Orleans sound but there is much else going on – in particular, the overt political messages as Shabaka Hutchings identifies some of the queens that are important to him. The example this week was Nanny of the Maroons. It has not always been recognised that the enslaved in the Caribbean resisted and fought their colonial oppressors. The Maroons were a community of the formerly enslaved who escaped to the hills of Jamaica, where they lived in freedom and resisted the British. Nanny of the Maroons was one of the leaders of that resistance. Some of us can remember record sleeve notes that reached the land of the fanciful (to put it mildly) in terms of the way they described the music. There is a recent album cover where the notes verge towards this. Apparently “They’re on a chessboard, grading on, trading off”. Unlike, however, many of the past examples, the music is excellent. The album in question is Blue Dream by the Jamie Saft Quartet. Great musicians led by Jamie Saft on piano. Bill McHenry on tenor sax, Bradley Christopher Jones on acoustic bass and Nasheet Waits on drums. Trivia point: Saft is undoubtedly the man with the longest beard in jazz. The rest of the programme included another contribution from the lost John Coltrane album Both Directions At Once. It was a version of Impressions – surely one of ‘trane’s best, whichever interpretation you hear. That album will continue to feature on the programme in the coming weeks and probably beyond. Someone whose sound suggests that he was influenced by Coltrane is Tony Burkill – but are there many tenor sax players who have not been? Burkill hails from Leeds, UK with contributions on his album Work, Money, Death from the Headingley Hand Choir, Neil Innes and Matthew Bourne. We followed up with more British music from the Ezra Collective, and then an upbeat ending from Finnish saxophonist Timo Lassy. This week’s show has music I am really excited about. I enjoy every show but, almost inevitably, the music in some is extra special. It was one of those weeks. After having just acquired the music there was only one place to start – the recently released ‘lost’ album from John Coltrane. What a joy for a new album to be released from the classic quartet of John Coltrane, McCoy Tyner, Jimmy Garrison and Elvin Jones. Both Directions At Once has 90 minutes of previously unheard music recorded at Rudy Van Gelder’s studio on 6 March, 1963. The tapes of this album were found only recently in the possession of the family of Coltrane’s first wife Juanita Naima – the Impulse! label had no copies. There are versions of well-known pieces from the Coltrane repertoire such as Impressions and One Up, One Down but two of the tunes are untitled and it was one of these – Untitled original 11386 that was included in this week’s show. It should not be necessary to say this but at Cosmic Jazz we’d simply say that this album is essential for any jazz lover. Often on the show I play tunes that have appeared on my iPod during the week and to which I give particular notice. This week it was another group discovered through Steve’s Jazz Sounds – the Audio Feeling Trio led by pianist Pawel Kaczmarczk. They have been described as like EST with Polish melancholy. Certainly on the tune Along the Milky Way you can hear the EST influences, but I’m not sure about that melancholy. My favourite contemporary album of the moment comes from UK alto & soprano sax/flute player Sean Khan. Palmares Fantasy is released on the wonderful UK label Far Out and was recorded in Rio de Janeiro with additions in London. The album includes Brazilian royalty, featuring Hermeto Pascoal playing a variety of instruments – for example, Fender Rhodes and vocals on the title tune and melodica on Said, the two tunes played this week. There is also Azymuth drummer Ivan ‘Mamao’ Conti, described by Far Out publicity as Brazil’s answer to Tony Allen, plays on several tunes and Sabrina Malheiros is on vocals for a magnificent version of a classic Brazilian tune. There are also appearances from a doyen of the UK jazz scene, Glasgow-born guitarist Jim Mullen and former Cinematic Orchestra vocalist Heidi Vogel. It is essentially a jazz album but the sounds and feelings of Brazil are definitely in there. Your Queen is a Reptile provides a powerful statement on British colonialism, history and nationality with Shabaka Hutchings creating tune titles which are a list of the ‘queens’ important to him. The queen in this week’s show is Mamie Phipps Clarke, who researched the detrimental effects of segregation on African-American school children. The toasting input came from Congo Natty. Dub sounds continued with Mollison Dub, a track from young British pianist Joe Armon-Jones and his album Starting Today. The record includes contributions from Moses Boyd and Nubya Garcia, who appear also on Your Queen is a Reptile. Binker Golding and Moses Boyd are no strangers to reggae influences in their music and a track from their 2017 album Journey to the Mountain of Forever was a fitting end to this week’s show. Pawel Kazmarcz Audio Feeling Trio – Along the Milky Way from Deconstruction (Vars and Kaper). Sean Khan featuring Hermeto Pascoal – Palmares Fantasy from Palmares Fantasy. This was a pre-recorded show and on such occasions I tend to select some Cosmic Jazz favourites from albums we have played before. This week proved to be no exception. W e regularly celebrate emerging jazz artists from across the globe on this show and so we began with two contemporary Blue Note artists – Otis Brown III and Marcus Strickland – and both found themselves in the company of more well known CJ regulars. The 2014 (was it really that long ago?) release on from drummer Otis Brown III The Thought Of You has been a particular favourite and features some notable guests including vocalist Gretchen Parlato, trumpeter Keyon Harrold – whose recent solo record we have featured – and keyboard player Robert Glasper. It’s tough, contemporary urban jazz. Next up was saxophonist Marcus Strickland and his 2016 album Twi-Life which – surprise, surprise, also included Keyon Harrold and Robert Glasper, this time alongside regular Robert Glasper Trio drummer Chris Dave and a rising star on the skins, Charles Haynes (no relation), who occasionally steps outside of the jazz world to tour with the likes of Lady Gaga and Ed Sheeran. There were records from two trumpeters on the show this week. First up was the long-established Polish musician Piotr Wojtasik, whose music we continue to play on the show simply because it deserves to be heard as widely as possible. Wojtasik is a star who is not heard anything like as frequently as he should be on UK (and US) radio. All the more inexcusable when he surrounds himself (as here) with musicians of the calibre of Gary Bartz, Vincent Herring, Billy Harper, George Cables, Reggie Workman and Billy Hart. Yes – all appear on this album! As always, you can track it down at the ever-reliable Steve’s Jazz Sounds. Much more celebrated is US trumpeter Ambrose Akinmusire who, on his album When the Heart Emerges Glistening, did not surround himself with a bunch of starry sidemen but rather introduced a complete band – and it feels like it too. Although piano star Jason Moran (he of the Charles Lloyd New Quartet) produced the album and appears on a couple of tracks, this album has reflective, sensitive playing throughout from all personnel. Akimusire has continued to plough his own furrow: his 2017 live 2CD collection is as uncompromising as ever with alternately introspective and fiery music that bears extended listening. Like many jazz artists before him, Akinmusire appears to have been inspired by his recording venue – New York’s iconic Village Vanguard. As often on Cosmic Jazz, we changed the tone with a Brazilian sequence. Singer/songwriter Sabrina Malheiros – daughter of the Azymuth bass player Alex Malheiros – produces cool but joyful samba/ jazz influenced music, and her record Clareia (released on the UK’s Far Out label in 2017) is a wonderful example of the genre. The record was produced in London by Daniel Maunick, son of Incognito founder Bluey Maunick, and a hit (again) at this year’s SingJazz Festival. Malheiros was born in 1979 so she may not now be a young Brazilian voice but she’s certainly the junior of a clear influence on her sound, Joyce Moreno. Here on Cosmic Jazz we admit to something of an infatuation with Joyce’s music. And – by the way – it’s not that which allows first name familiarity: in the tradition of her compatriots (Ceu, Cibelle and Simone), Joyce has gone by her first name since her earliest recordings. Born in 1948, her classic album Clareana was released a year after Sabrina Malheiros was born and she has continued recording for Far Out since the 1990s. The tune this week came from one of her more recent recordings for the label, the excellent Raiz. All of her work is highly recommended and there is a fine Mr Bongo compilation available to introduce her earlier music. To end our Brazilian sequence we featured another Brazilian veteran – singer/songwriter/guitarist Jorge Ben, master of an afrosamba style that has influenced many more contemporary Brazilian artists. Boiadero comes from one of Ben’s more disco-influenced albums (check the cover!) but is still a great tune. Check out an interesting Ben meets Fela with rap track in Neil’s listening choices (below) and for more Jorge Ben, new listeners should go straight to a mid70s classic, simply called Ben. It features two of his most enduring compositions Taj Mahal and Fio Marahvila, a musical ode to the 1970s star of the Brazilian soccer team Flamengo. To end the show this week, it was back to the USA and another favourite. Jazzmeia Horn is a young singer born in Dallas, Texas but now based in New York. She won the Thelonious Monk Institute International Jazz Competition in 2015 and her excellent first album A Social Call emerged last year. It may be a record of jazz standards, but it is how Horn – ably supported by some superb musicians – transformed these tunes that made this album a real 2017 highlight. Click the MixCloud tab to hear a varied selection of music in this week’s show. Cuba, USA, Brazil, Poland, Japan, France and the UK are all represented. Our first tune is a family affair. Bebo Valdes and Chico O’Farrill, along with pioneers Mario Bauza and Machito, were leaders in the field of Afro-Cuban jazz music. Bebo was a composer and pianist and Chico a composer and bandleader and now their sons have worked together to perform in concert and then to record as a tribute to their fathers. In this 2CD set even a third generation – their respective children – feature on the second CD. Ecucaion was composed by Bebo Valdes and has both Arturo and Chucho on piano. The CD notes describe it as demonstrating the elegant compositional style of Bebo with a rich soaring melody, sophisticated arrangement and lush harmonies. It is hard to disagree. Our CJ music stayed Latin but shifted to Brazil. Wilson Simonal was a singer from Rio de Janeiro and Nana, recorded in 1964, is one of those Brazilian tunes that you wish had been embellished and lengthened. The instrumental break is exciting but I find myself wishing the musicians had been given the freedom to continue. Although short and very sweet it’s a wonderful tune, and one that has you humming along and tapping your feet. Keyboard player/composer/arranger Marcos Valle came next. Throughout his long career he has had a wide range of influences – bossa, soul, pop, electronica – but always with a Brazilian spirit. His music has been recorded by several Brazilian artists including Wilson Simonal. His excellent 2001 release Escape on the British Far Out label has some electronica moments but is a strong and recommended release that really captures Valle’s compositional qualities. Our Brazilian sequence this week ended with a jazzy piece recorded in 1968 by alto sax player and clarinetist Paula Moura who appeared on Cannonball Adderley’s 1962 Bossa Nova release and recorded music through to his death in 2010. This is his take on Milton Nascimento’s classic Tardes – try this version with Wayne Shorter from the excellent Native Dancer album. The show continues to feature what appears to be the endless stream of exciting, young musicians from Poland. Emil Miszk is a trumpeter who leads the wonderfully named eight-piece Sonic Syndicate. The tune Chorale (Ballad No. 31) has a beautiful soaring chorale effect with Miszk’s trumpet at the head taking the lead. It was quite a change from the music of Brazil but its rapturous sounds soon take you to other interesting places. We followed this with more Polish music from the Confusion Project trio. The album Primal is divided into chapters and also takes you on a journey – this time to follow your instincts to discover primordiality! Deep, soul-searching music. There was a Polish-British connection with the piece from Alina Bzhezinska, a harpist brought up in Poland but now based in London, where she teaches harp at Goldsmith’s College. Bzhezinska is accompanied on her debut album Inspiration by British musicians – the fine and seemingly these days ever present saxophonist Tony Kofi, bassist Larry Bartley and drummer John Prime – on this version of another Coltrane favourite, his original composition After the Rain. This beautiful tune has been recorded by many jazz artists – compare with this respectful tribute from guitarist John McLaughlin (which features original Coltrane quartet drummer Elvin Jones vocalising over his kit). Traditional British folk music is not something one would usually associate with jazz, Japan or spirituality but there’s a long traditional in jazz of improvising from traditional melodies – think of John Coltrane’s take on Greensleeves, for example – and these three elements certainly come together in a track from the excellent new(ish) Jazzman compilation Spiritual Jazz 8: Japan. The quartet Four Units deliver their take on that traditional folk club favourite Scarborough Fair – and very good it is too. We ended Cosmic Jazz this week with Kamasi Washington and another track from his latest Heaven and Earth release. It’s very encouraging to see both this jazz album and the John Coltrane reissue Both Directions at Once placed high in worldwide music charts. The jazz renaissance continues apace! Derek is listening to ….. This week’s Cosmic Jazz featured five new releases and one old favourite. Check them all out by clicking on the tab left. First up was the opening track from Nat Birchall’s latest jazz release, suitably titled Cosmic Language. Birchall is an expert on Jamaican dub (check this out via his Sound Soul and Spirit website right here) but we should now add Indian ragas to his musical influences. Man from Varanasi replaces piano with the Indian harmonium, a small pump organ. The idea for the album came from a one-off performance at the Maharishi Golden Dome meditation centre in West Lancashire. Birchall brought along his own harmonium, an instrument he hadn’t previously used in his music. From this came the music that makes this latest release on the Jazzman label rather different from Birchall’s previous output. Man from Varanasi is dedicated to Bismillah Khan, one of Birchall’s Indian influences, and sees him taking cues from the Indian raga tradition which underpinned Khan’s music. Like another clear influence, Birchall’s music travels along the path of Alice and John Coltrane in exploring jazz that is informed by Indian religious music and – like much of the music we feature on this show – Birchall explains that, for him, The whole act of making music is a spiritual experience. It’s during performance and when playing music that I look for a kind of truth. It’s with music where I find myself feel closest to attaining that ‘enlightened’ kind of feeling. On rare occasions I’ve actually felt as though I was listening to the music being played rather than being involved in making it, almost like an out-of-body experience. It’s worth adding that Birchall has moved even further way from jazz with his second release this year. Sounds Almighty is an instrumental roots reggae dub LP featuring legendary Jamaican trombonist Vin Gordon who has played with Bob Marley and The Wailers, Burning Spear, Yabby You and many more. All original tunes on the album were recorded old school style on vintage analogue equipment and mixed by dub master Al Breadwinner at the Bakery Studio in Manchester. The vinyl edition is limited to 500 copies. It was inevitable given his current status in the contemporary jazz world that Kamasi Washington had to be included in this week’s show following the recent release of his Heaven and Earth record. Anyone who loved Washington’s first release, the suitably titled 3CD set The Epic, will go for this record too. It has all the familiar elements – the full-blown orchestra, that choir and Washington’s rasping sax sounds. But this new one is more than just a rerun of The Epic. First thing is a surprise addition – on both vinyl and CD versions there’s a third disc hiding in the packaging. It wasn’t in the pre-release review copies and so we’ve focused on it in this week’s show. This third disc is called The Choice and includes some notable covers, including Ooh Child, originally recorded by Chicago soul group The Five Stairsteps. There is also a cosmic feel to Chip Wickham’s The Mirage – and a connection to Nat Birchall in that it features another Manchester musician, trumpeter Matthew Halsall, in whose band Birchall used to play. In fact, I have witnessed them playing together. We followed this with two tunes that went back to the roots of rather contrasting locations and sounds. The Brooklyn Funk Essentials were part of a heathy 1990s New York club scene that fused jazz, rap, and funk and their 1995 album Cool and Steady and Easy introduced their great take on Pharoah Sanders’ The Creator Has a Master Plan. Behind the collective of over 20 musicians was legendary producer Arthur Baker, whose great 12″ house single It’s Your Time I am listening to as I write [notes Derek]. Brooklyn Funk Essentials are due in London soon – it should be quite a party. Rooted in a different way is Joachim Mencel, a Polish pianist who also plays the hurdy gurdy and fuses Polish and Slavic folk music with modern jazz. Each tune on his latest album Artisena is named after a Polish traditional dance and whilst Mencel’s music has an authentic traditional sound, it is definitely modern jazz. One has to treat fusions with caution but this one – like Nat Birchall’s – really does work. With Mencel are Weronika Plutecka (violin), Syzon Mika (guitar), Pawel Wszolek (double bass) and Syzmon Madej (drums). As with much of the excellent Polish jazz we play on the show, this album comes direct from Steve’s Jazz Sounds – check out their superb stock. To end the show we focused on a new/old release. The list of ‘bootleg’ sets uncovered by Columbia Records from the Miles Davis vaults continues to surprise. The 4CD set Volume 6 features Davis with Coltrane in his final concerts with the band and we included one of the most famous tunes in all jazz, Davis’s composition So What, recorded live in Paris. The tensions on this final tour created some stunning performances from both artists and whilst many of the tunes may be familiar to listeners, these new versions will surprise. It’s difficult to guess what will be next in this seemingly inexhaustible series but I’m personally waiting for the craziness of Miles in Japan on his last tour before retirement in 1975. Some of this fractured, angry music has been released already but there is undoubtedly more. You can see and hear music from the Osaka show right here. This week’s Cosmic Jazz was big on new leftfield sounds – and some of them may not even be jazz. As always, you decide. We began with Quin Kirchner and his six piece band. Drums and Tines Part 2 comes from his surprising new release that shuttles between big band jazz of the kind that could have come from Charlie Mingus at his peak to more outre stuff like our opening track, which reflects Kirchner’s background as a drummer with – among others – Nomo, who employ centrestage the kind of African kalimba (or thumb piano) sounds you heard here. This excellent album – a full 90 minutes of invention – is titled The Other Side of Time. We recommend that you check out and buy the whole thing here on Bandcamp. More from Kirchner to follow – his straightahead reading of Sun Ra’s Brainville, a composition from an early album (1957) called Sun Song – and then, to complete our leftfield start, Ornette Coleman and the title track from his album Broken Shadows (1971). With Coleman on alto sax was Don Cherry on trumpet, Dewey Redman on tenor, Charlie Haden on bass and Billy Higgins on drums. Next up was a chance to head back to the current BritJazz scene with the rather unexpected lilting choice from Kokoroko, a UK ensemble with an all-female horn section led by trumpeter Sheila Maurice-Grey. Abusey Junction ends the Brownswood collection We Out Here which we’ve showcased heavily over the last couple of months. The solo guitarist is Oscar Jerome. The show continued with a last listen (for now) to these new British sounds with a track from Nubya Garcia and her 12inch single release When We Are with its powerful drumming from Femi Koleoso. The vinyl is (of course) now sold out, but you can still download digitally from the Bandcamp site here. Staying very much on the left side we next checked out a remix project. Santuri’s Embaire Umeme from the Mugwisa International Xylophone Group has been reconstructed by Soundthread’s Sam Jones from village recordings in Uganda. He described the process: Having captured the instrument in its natural habitat we set about finding the appropriate producers to then re-articulate the sessions. For my construct I was keen to keep the essence of the instrument and its players as true as possible. Borrowing from the cyclical nature true to its original played style, adding minimal classic old synths, tape delays, guitar stabs and some vocals. The newest album from Californian trio Bitchin’ Bajas includes a Sun Ra cover and so we had to air it here on Cosmic Jazz. The band creates sprawling soundscapes that mix psychedelia, drone music, kosmiche and cosmic jazz and their take on Ra’s Angels and Demons at Play is a fascinating take on Ra’s 1960 track from the album of the same name. It dramatically slows down the melody and creates something unique. It seemed appropriate to follow this with a cut from French DJ Blundetto’s latest on the ever-creative Heavenly Sweetness label. Max Guiguet is a programme planner on the excellent Radio Nova and World Of… is his third release and features soulful reggae vibes with guest vocalists including Biga Ranx, New York MC Jahdan Blakamoore and newcomers John Milk and Marina P.
We ended the show this week with a return to more mainstream jazz from altoist Art Pepper. Much of Pepper’s work from the 1950s is well known but this take on Red Car is from the end of Pepper’s troubled career in jazz. By the spring of 1981 Pepper was riding what would be the last creative wave of his checkered career. Just over a year later he was to die of a stroke. Incarcerated several times as a result of his heroin addiction, Pepper enjoyed a prolific period through the mid1970s to the turn of the decade, and – in this reviewer’s opinion – was playing some of the most creative, spiky music of his career. The story behind the track is that Pepper decided he wanted a new car, and Les Koenig (owner of the record label Contemporary Records) advanced him the money for a bright red Oldsmobile Cutlass Supreme. 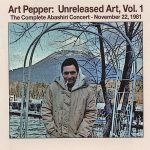 Pepper’s widow Laurie Pepper has been curating her husband’s many live releases from these years and this 12 minute version of Red Car comes from one of his last albums, recorded live in Japan in 1981. The quartet features Pepper on alto sax, George Cables on piano, David Williams on drums and Carl Burnett on drums. What a way to finish! This week’s show has the usual mix of old, new and nearly jazz music with musicians from different countries and diverse heritages. Tap the Mixcloud tab (left) and enjoy. It happens regularly that I hear a tune on my shuffle songs and react with total pleasure and enthusiasm. The outcome is an airing on Cosmic Jazz. The latest example is the Cannonball Adderley Quintet playing Mercy, Mercy, Mercy. 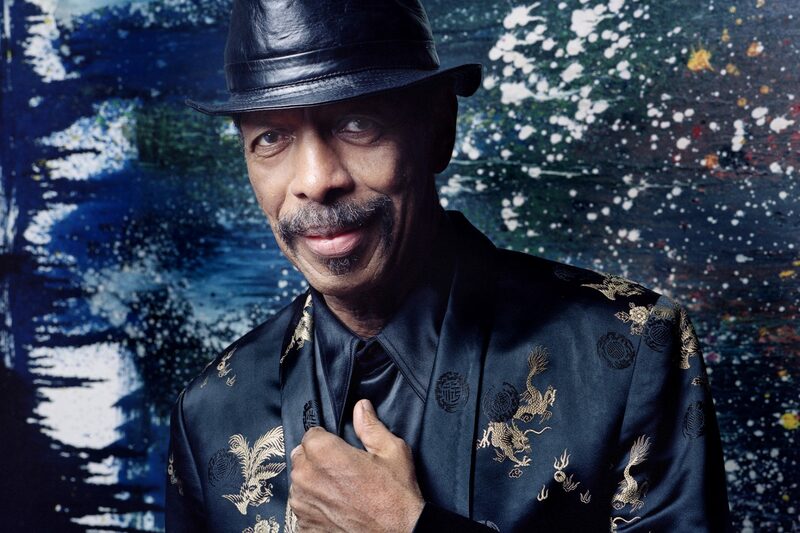 This classic souljazz composition was by Adderley’s Austrian-born pianist Joe Zawinul who later went on to form Weather Report with saxophonist Wayne Shorter. Is there a more uplifting piece of souljazz (with more than a hint of gospel)? It’s billed as being recorded live at The Club in Chicago, but was actually set up as a live studio recording in Capitol Studiios in Los Angeles by famed produced David Axelrod. Adderley wanted some publicity for his friend who owned The Club and so billed the new album as this. To make sure the audience were on good form, Axelrod created a guest list and provided free drinks. However, he needn’t have worried: the album went on to be one of Adderley’s most celebrated performances and the audience participation just adds to the wonder and joy of the music. Take a listen and join in the fun yourself! Neil notes: for the same kind of interactive audience response there’s just one other competitor – Donny Hathaway’s album simply called Live, recorded at two clubs – the Troubadour in Hollywood and The Bitter End in New York. For a a taste of one of the best live albums in any genre, try The Ghetto, which features a terrific Fender Rhodes solo from Hathaway. The next selection was from new album Arise by Zara McFarlane whose previous records I have also bought and enjoyed, including the recent 10″ single version of Max Roach’s tune All Africa. Alongside drummer Moses Boyd on production, the album features a stellar line up of some of the key players on the London scene: Binker Golding on tenor sax, Peter Edwards on piano, Shirley Tetteh on guitar, Nathaniel Cross on trombone and an unusually restrained turn on clarinet from Shabaka Hutchings. All these musicians are very much key to the current jazz renaissance in London and all explore links between different musical styles – from US hard bop and free jazz, to reggae and dub. They’re boosted by new platforms like East London showcase Church of Sound and a newly-refreshed Jazz Café and with these impeccable credentials and a clutch of favourable reviews, including a cover feature in the Black Music monthly Echoes, I felt I should like this record. Sadly, I didn’t. Arise aims to connect Caribbean origins to African music, jazz and funk to the narrative of a Black Londoner but somehow I was disappointed. As the tune Fussin’ and Fightin’ started, I was reminded of How Long Jah by my old friends Misty in Roots. The track starts in militant style but then deteriorates into lighter repetition. The album as a whole has a touch of uplifting militancy but it is not maintained and, put simply, I am not enjoying the tunes. I wonder from what I have read if I am alone in my judgement, but – as always – listen and judge for yourself. I shall play more and listen more. Arise could grow on me but at the moment I am unconvinced. Trumpeter Avishai Cohen’s 2017 release Cross My Palm With Silver is a heavy and serious work, not for casual background listening, but for intense and deep involvement. It is released on ECM Records, with the characteristic cover style cover and immaculate produced by label owner Manfred Eicher. Yonathan Avishai is on piano, Barak Mori on double bass and Nasheet Watts on drums. There was another of our regular forays into contemporary music from Poland. Marcin Losik is a newly rising Polish piano talent playing improvised music with energetic phrasing filled with contrasting rhythms. The NAK Trio features Jacek Kochan as pianist and composer, Dominik Wania on piano and Michal Kapczuk on bass. One Polish reviewer on the Polish Jazz Blogspot described The Other Side Of If as an album where mathematics takes the upper hand over metaphysics. Whatever, I enjoyed it. I returned to the Michael J. McEvoy album The Long Way Home which I know my colleague Neil loves – and so do I. The London-based pianist/composer has put together an album of jazz that is both at times soulful and from the evidence from the two tunes played this week beautiful as well. He has garnered some leading British jazz players as guests on the album, including trumpeter Gerard Presencer who appears on Stillness and Being and saxophonist Ben Castle who is featured on When I Get My Wings. We have supported and enthused about the Spiritual Jazz series of compilations from Jazzman records. The series is now up to Volume 7 and from this compilation came the wonderful Morning from the incomparable Yusef Lateef. It begins in the same vein as his classic tune Before Dawn and progresses into music that is what can I only describe as spiritual. You can find this track on Lateef’s 1957 release Jazz Moods – worth getting for every track. This was f ollowed by John Coltrane’s timeless Equinox, its persistent three beats built around the bass and modal enveloping tune ascending the listener further towards the ethereal. Equinox comes from Coltrane’s Sound – one of his last Atlantic Records, and a must for CJ listeners if they don’t know it. * The music here comes from the one continuous session for Spalding’s upcoming new album Exposure. The fascinating recording process is outlined here on Spalding’s website where the whole three day process was recorded live and broadcast live for a global audience. Once the cameras started rolling, viewers could see every second of Spalding’s process, including her eating and taking breaks to sleep in the studio, making it the first album ever created entirely on Facebook Live for an unprecedented 77 hour live feed. Once the record is finished, a limited edition 7,777 CDs will be released and the packaging of each CD will include a piece of the original notepaper Spalding will have used to write the lyrics and music. It’s expected that the album will be released in November 2017. Cosmic Jazz usually mixes the old and the new but from time to time we like to have a programme where all the tunes are from the past. This week was one of those programmes and while there were two or three favourites we have played before, most were new to the show. There is a tendency in such a format to resort to our US favourites – but not this time. We began in the UK with a band that really did epitomise the best of British jazz. Long before Gilles Peterson championed the Don Rendell/Ian Carr Quintet for a new hip audience, here at CJ we were fans of the band and their ability to go beyond the post-bop conventions of the time and really stretch out on some extraordinary tunes. Shades of Blue is just such an example – it’s an oasis of stillness and calm throughout but driven by the gorgeous tones of Rendell on soprano and tenor saxes and Ian Carr on trumpet. Recorded in 1964, this album title tune was written by composer Neil Ardley and played by a band that truly showed how innovative, inventive and deeply engaging the UK jazz scene could be. After the quintet folded, all its members continued to play and make their mark both in the UK and wider with trumpeter Ian Carr writing the go-to biographies of both Miles Davis and Keith Jarrett. Mark Murphy’s version of Stolen Moments was one of the tunes that has made several appearances on the show before. I make no apologies for playing it again. Yusef Lateef also appears on many of our playlists and Chang, Chang, Chang, originally from the album Before Dawn and reissued on the excellent Soul Jazz compilation Black Fire! New Spirits, is one we have played before. The terrible destruction wreaked on several Caribbean islands by Hurricane Irma made me want to recognise the musical creativity of the people there as a mark of respect. In 2015 the label Heavenly Sweetness released a highly recommended compilation called Koute Jazz, which covers music from the French Antilles in the 1970s and 1980s, where the jazz of the time embodied a return to roots music as well as to free jazz. This was exemplified by the selection of Gwadloup by trumpeter Edmony Krater and his band Zepiss. He was born in Guadeloupe but the tune was recorded in Paris. It used traditional percussion evocative of the Antilles and in the words of Edmony Krater. This song describes how we don’t manage to value our history, our specificity. Brazilian gems from the past seem to be hard for me to avoid at the moment. Once again, we featured tunes that have been re-released on British labels. The amazing Tenorio Jr’s Consolacao is – like most of his music – just over two minutes of perfection. Sadly, Tenorio Jr seems to have travelled from Brazil to Argentina to then become one of the disappeared under the military junta there. The track is available on Bossa Jazz Vol 2 from Soul Jazz Records. Milton Banana’s equally compact (and perfect) Cidade Vazia from 1966 was re-released via the Mr. Bongo label in their excellent Brazilian Beats series. Finally, there was a taste of another Cosmic Jazz favourite, Patrice Rushen, who any listener to the programme or reader of the blog should know by now has had a life outside Forget Me Nots. Yusef Lateef – Chang, Chang, Chang from Black Fire! New Spirits!